The FLIR T1020 Thermal Camera, the first camera in the new FLIR T1K family, deserves a few superlatives. Start with the most resolution in a handheld camera thanks to the new 1024 × 768 HD detector, producing 3.1 MP images with UltraMax. To gather all this light, FLIR has designed new optics from the ground up. Then bring the best thermal sensitivity available in a FLIR camera, down to 0.02 °C. It all adds up to the best picture in portable infrared, with the most accurate temperature measurements. The FLIR T1K not only sets a new standard in image quality, it pushes the boundary of what we can see with infrared. The workhorse behind the brilliant images of the FLIR T1K is a new thermal detector with a resolution of 1024 × 768. Gone are the fuzzy thermal images of years past; at this resolution you can see crisp edges and tiny targets. With a cutting edge sensitivity of just 0.02 °C, tiny temperature variations combine to give the FLIR T1020 a picture that's rich in thermal data. The new detector can view and measure a huge span of temperatures, from -40 to 2000 °C (-40 to 3632 °F), ensuring that you can investigate anything you may encounter. Lenses are not all created equal: better optics mean greater accuracy. So backing up the detector in the T1K is a completely new line of optics optimized for high definition infrared imaging. Known as OSX Precision HDIR Lenses, they have been optimized to gather more light while minimizing the effect of hot or cold spots just outside of the view. Continuous autofocus and a dynamic manual focus will ensure that your work always looks its best. Lenses for the FLIR T1020 are available in a variety of lengths from telephoto to wide angle to close up. A new, faster processing technology provides images with more detail and less noise. Meanwhile, onboard sensors act as an ambient temperature compensation system. So whatever your work conditions, the FLIR T1020 camera will account for possible atmospheric interference. With a new detector, new lens, and the best onboard processing, it’s no wonder the T1K can promise what few thermal cameras can: 1% accuracy across its central temperature range. Even at temperature extremes, accuracy is still an impressive 2%. Attention has been given to every component, and together they add up to a better infrared camera. Further enhancing the image of the FLIR T1020 are a host of other hardware and software features. Using the built in digital camera, MSX will identify edges of objects and patterns and add these to the full infrared image. So items such as text that used to be invisible in IR are now visible right in the thermal image. A software enhancement called UltraMax borrows a technology from commercial photography known as super-resolution to create images with higher resolution and less noise. With UltraMax the T1K will capture 16 infrared photos in under a second. These are later combined into a single image with double the resolution, or 3.1 MP. While quite a few thermal cameras now record infrared video, the FLIR T1K takes this a step further–it will record full radiometric video right to the camera. So each pixel of the video includes temperature data that can be processed and analyzed later. Recording radiometric video in the field at 30 Hz may just reveal the anomaly you have been chasing. Or for longer term analysis, the T1K can be connected to a PC via HDMI cable to stream live radiometric video to the included software. Included with the FLIR T1K thermal camera is the upgraded FLIR Tools+ software for PC. Here you can organize your images into folders and subfolders, grouping visible and thermal images as you see fit. Color palettes can be changed, and a variety of spot meters and measurement boxes added for further analysis. With FLIR Tools+ you can even stitch together a series of images to create a panoramic thermal image. Advanced reporting options range from a pdf with your company logo, to compatibility with the latest versions of Microsoft Word. Expanding the reach of the T1K, the camera can communicate with other devices using built in WiFi and Bluetooth. It will join a network or create its own wireless network to connect to nearby phones and tablets running the free FLIR Tools Mobile app for iOS and Android systems. This will mirror the screen of the T1K and allow image capture and even focus control from the mobile device. Mount the T1K to a tripod and monitor your work from a distance as needed. Bluetooth will connect the camera to a variety of FLIR test and measurement tools from clamp meters to moisture meters, capturing their data right alongside the thermal image. 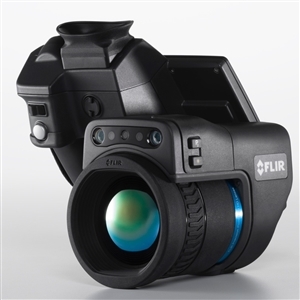 FLIR engineers have designed the T1K to maximize convenience and ergonomics. The touchscreen offers various levels of brightness to allow viewing even in direct sunlight. Or if more convenient in severe glare, the push of a button will send the live image to the built in high resolution viewfinder atop the camera. Four programmable buttons and two programmable measurement settings allow you to quickly change between your most commonly used settings. The rotating optical block gives a useful variety of screen angles to save your back or even to help look overtop higher targets. And with built in GPS and compass direction added to every image, you will never again have to wonder where a picture was captured. The FLIR T1020 Thermal Camera comes with a full 2 year warranty that covers all parts and labor, a 5 year warranty on the battery, and a 10 year warranty on the HD thermal detector.